Large sterling silver horse head set with cubic zerconia and rhodium plated. 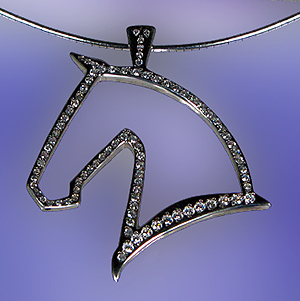 The Gorgeous Horse is your source for saddlebred horse jewelry. Large outline of a saddlebred head set with cubic zerconias and rhodium plated for a supreme finish. Priced to sell and designed with the economy in mind makes this piece enjoyable for any budget. Dimensions: 1 3/4 inches wide x 2 3/8 inches tall. Set with cubic zerconia stones and rhodium plated.